"Narrow streets, if they are not too narrow (like many of Boston's) and are not choked with cars, can also cheer a walker by giving him a continual choice of this side of the street or that, and twice as much to see. The differences are something anyone can try out for himself by walking a selection of downtown streets. This does not mean all downtown streets should be narrow and short. Variety is wanted in this respect too. But it does mean that narrow streets or reasonably wide alleys have unique value that revitalizers of downtown ought to use to the hilt instead of wasting. It also means that if pedestrian and automobile traffic is separated out on different streets, planners would do better to choose the narrower streets for pedestrians, rather than the most wide and impressive. Where monotonously wide and long streets are turned over to exclusive pedestrian use, they are going to be a problem." "The real potential is in the street, and there are far more opportunities for exploiting it than are realized. Consider, for example, Maiden Lane, an odd two-block-long, narrow, back-door alley in San Francisco. Starting with nothing more remarkable than the dirty, neglected back sides of department stores and nondescript buildings, a group of merchants made this alley into one of the finest shopping streets in America. Maiden Lane has trees along its sidewalks, redwood benches to invite the sightseer or window shopper or buyer to linger, sidewalks of colored paving, sidewalk umbrellas when the sun gets hot. All the merchants do things differently: some put out tables with their wares, some hang out window boxes and grow vines. All the buildings, old and new, look individual; the most celebrated is an expanse of tan brick with a curved doorway, by architect Frank Lloyd Wright. The pedestrian's welfare is supreme; during the rush of the day, he has the street. Maiden Lane is an oasis with an irresistible sense of intimacy, cheerfulness, and spontaneity. It is one of San Francisco's most powerful downtown magnets. Downtown can't be remade into a bunch of Maiden Lanes; and it would be insufferably quaint if it were. But the potential illustrated can be realized by any city and in its own particular way." Now, Maiden Lane is an example of the "old urbanizing" of the 19th century speculative grid: the process in which large grid blocks along wide streets were subdivided by lanes of more human, and less wasteful, dimensions. It was a process which occurred in nearly all cities of that era and plan, but nowhere more notably than in Melbourne. Still, as you can see, Maiden Lane is not a "really narrow street," in Nathan Lewis' terminology, but of a width that is comparable to the major commercial thoroughfares of late medieval and Renaissance-era cities. It is only narrow by comparison to the typical urban street laid out by the 19th century grid-makers (and in fact Jacobs' article mentions only American examples). "Paving which merged roadbed and sidewalk would probably induce more pedestrian use of roadbed space .... However, that is apparently only part of the answer. In suburban shopping centers where "streets" are wide but thoroughly pedestrian and without curbs, people stay to the sides also except where something interesting to see has been deliberately placed out in the "street." It takes tremendous numbers of pedestrians to populate the whole width of the roadbed, even in scatterings. The only times pedestrians seem to use, or want to use, a street roadbed in this fashion are in cases of extraordinary floods of pedestrians, as in the Wall Street district or the Boston financial area when the offices let out .... In more ordinary circumstances, people are attracted to the sides, I think, because that is where it is most interesting." Jacobs was not the only urban thinker of this era appreciative of narrow streets (Bernard Rudofsky and Kevin Lynch had similar things to say, using more frequent reference to foreign examples), yet Jacobs stood out for looking past aesthetics to grasp the universal logic of urban form and human behavior that made places like Maiden Lane work so well. *Raymond Unwin in 1909's Town Planning In Practice made several references to the aesthetic merits of narrow streets in medieval towns, and even criticized the minimum street width ordinances of his day, but did not dwell on these streets' urban functionality (and, ultimately, did not take literal inspiration from them in his own designs, indicating that he did perhaps see them as functionally obsolete). I always felt her emphasis on small blocks leads naturally to the notion of narrow streets. Having small blocks with wide streets means you are wasting a lot of land on asphalt. One thing Jacobs was also a big proponent of was wide sidewalks. She fought against the removal of sidewalk space in 1950s New York to add street parking or additional driving lanes. That's still not a "really narrow streets" typology, but it relates to the framework that was already put in place. Many streets had sidewalks that took up just as much space as the roadway (so say 15' sidewalk, 30' road, 15' sidewalk, or something in a similar ratio). 5th Avenue near the Flatiron Building even seemed to have more of the space devoted to the sidewalks than the road. This appears to be mainly a NYC thing, but it mitigated the excessive width of the building-to-building dimension to some extent. Jeffrey: I agree -- her observations on sidewalks I always understood to pertain to New York's already-wide streets, rather than serving as a suggestion for planning new streets (wide sidewalks, plus the implied roadbed, suggest a rather wide street). As I've mentioned a number of times, Jacobs' writings are so 'dense' with ideas, it's easy to forget all the things she's "said." So, thanks, Charlie, for bringing up this article, which I haven't read for a while and had somewhat forgotten about. While I still haven't gotten a chance to find my copy of the entire article, it seems to me from the quotes you've posted (and also from "Death and Life . . . " which I'm currently rereading), it's inaccurate to characterize Jacobs as making "a case for the functional benefits of narrow streets." Rather, I think it's more accurate to say that Jacobs felt that it's important to see, and not overlook, the usefulness that existing old narrow streets can still have in great (large) American cities. Downtown  can't be remade into a bunch of [San Francisco's] Maiden Lanes; and  it would be insufferably quaint if it were. In "Death and Life . . ." (which was written over the subsequent three years and may have represented, as you point out, an evolution in her thought), Jacobs was interested primarily in understanding what made large modern American cities successful (i.e., Life) and unsuccessful (i.e., Death) -- in order to better be able to "save" them (since many of them were, at the time, under great stress). Hers was not, as many people seem to feel, a Martha Stewart like quest for the aesthetically most pleasing city. Rather, in Jacobs' view cities are seem primarily as economic engines, and it is important for their health to have streets (and even highways too!) that are supportive of their modern day commerce. Jacobs did feel, as others have alluded to, that wide sidewalks were also important for urban health, and thus she criticized mindless "roadbed" widenings that would needlessly encroach on these sidewalks. But this is not the same thing as recommending narrow streets -- streets being the distance between building lines, not the width of a vehicular roadway. Plus, if I remember correctly (haven't gotten to this part yet), it should also be pointed out that Jacobs was very skeptical about the usefulness of pedestrian streets to promote urban health. She wasn't against them per se, but did feel that (largely for economic reasons) they oftentimes created more problems than they solved, and that a better approach would often likely be the narrowing of a roadbed for vehicles, rather than the complete closing off of the street to vehicles. She did, of course, believe in the importance to urban health (large for economic reasons) of small blocks (a/k/a many streets). But, as far as I can recall, she didn't seem to be feel that the creation of small blocks with conventionally "wide" streets would lead to too much space being devoted to streets. That isn't to say, of course, that creating small blocks with narrow streets couldn't also be useful too (and possibly more practical) -- just that creating them with "wide" streets didn't, as far as I recall, seem to be a problem for her. I think the above points are important to make since many people do seem to erroneously believe that in "Death and Life . . ." Jacobs is somehow recommending that "great" American cities have, supposedly Greenwich Village-like narrow streets (most streets in Greenwich Village are not, in fact, narrow) -- and they then use this erroneous "fact" to dismiss her work! So it seems to me that "she recommends narrow streets" is one of the myths about Jacobs that needs to be debunked because it is obscuring what she really wrote -- which is, of course, what really should be discussed and evaluated. Sat., November 26, 2011, 2:00 p.m.
P.S. -- Thanks Jeffrey Jakucy for the links to the interesting photos. I've seen the shorpy site before (they once linked to a post of mine) but didn't realize that they had such interesting photos. "It would, of course, be ideal to dispose of cars entirely on city streets where children play; but worse troubles still are harvested if this means disposing of the other utilitarian purposes of sidewalks, and along with them, supervision. Sometime such schemes, too, are automatically self-canceling. A housing project in Cincinnati affords an illustration. The houses in this project front on pedestrian precincts of lawns and sidewalks, and they back up on service alleys for cars and deliveries. Al the casual coming and going occurs between the houses and the alleys and therefore, functionally, the backs of the houses have become the fronts and vice versa. Of course the alleys are where the children all are too." I don’t really take that as a critique of pedestrianization so much as a common sense observation that when transport is mainly by car, wherever the car goes will be the focus of human activity. Trying to hide this fact by placing garages in so-called “rear alleys” does not magically result in increased foot traffic. As far as narrow streets, the comment of hers that you quote really strikes me as odd coming from Jacobs, now that I consider it again. First, she presents no evidence for why a city could not be built of nothing but Maiden Lanes – she simply announces it. The second part of the comment is atypically aestheticist. “Insufferably quaint”? By whose standards? If it’s an impossible result, why belittle it? Again, this seems out of character for her. That her views may have changed over the next few years may be one possibility, or this article may have been intended for a somewhat different audience. The “functional” virtues of the narrow street I read as implied by the passage in Death and Life, which suggests that in a pedestrian-focused area, wide streets provide few benefits, since 1) people prefer to walk directly alongside shops; 2) it is nearly impossible for pedestrians to congest the roadways anyways, and 3) as she mentions elsewhere, the narrower the street, the easier it is to cross over to shops on the other side without hazard or delay. I read that, in combination which the favorable mention of shared space (“Paving which merged roadbed and sidewalk”), as indicating an appreciation of the benefits of narrower rights-of-way for a vibrant urbanism. I agree that this doesn't mean that she's advocating only narrow streets -- far from it -- only that she understood their benefits in certain contexts. Finally, after re-reading her section on cars and what she calls the “attrition of automobiles by cities,” I am getting the sense that the endpoint of her pro-pedestrian, or rather pro-urbanist, strategy is a car-free or at least car-lite city. She doesn’t say it explicitly (unsurprising as her strategy is to reach a desired goal through a lengthy series of piecemeal changes, deliberately avoiding anti-car rhetoric), but that would seem to be one likely outcome. Charlie, even when I disagree with them, your posts have been great -- as usual -- but I haven't had the time to comment on as many of them as I would have liked. But commenting on this Jane Jacobs one, however, is kind of helpful for a project that I'm trying to work on. "It would, of course, be ideal to dispose of cars entirely on city streets where children play; but worse troubles still are harvested if this means disposing of the other utilitarian purposes of sidewalks, and along with them, supervision . . . "
I don’t really take that [above quote] as a critique of pedestrianization so much as . . . Although this is one of the parts of "Death and Life . . . " I was thinking of, I was really thinking of her comments about things like Gruen's plan for Ft. Worth and similar pedestrian-free schemes for areas with businesses. If I remember correctly she says something like unless there is  some kind of viable way of bringing people into the area via transit and  some kind of viable way of making truck deliveries and pickups for factories, offices, stores, etc., pedestrianism creates more problems for a city's economy (and health) than it solves. Plus she also mentions, if I remembering correctly (and if I'm interpreting correctly what I remember) that people generally don't really "need" or "want" pedestrian streets anyway since, except on very narrow streets, people tend to cling to the sides anyway. From what I can see in real life, her critique of pedestrian streets has been very perceptive. And, although there is not 100% agreement on this issue, of course, it seems to me that among "urbanists" in general total or near total (with bus lanes only) pedestrianized streets are generally thought these days to be a failed idea. Furthermore, it seems to me that the idea of narrowed roadbeds instead of pedestrianized streets has shown its "superiorty" and has become more and more popular. The west side of Union Square in Manhattan, for instance, was rebuilt a few years ago, and some people called for it to be pedestrianized, but "cooler" heads prevailed and the roadbed was narrowed instead. And it seems to me that it has been a tremendous success. Also a lot of initiatives -- the successful ones -- of Janette Sadik-Kahn seem to be along these lines; and the "failed" ones (loudly opposed), seem to be along the totally pedestrianized lines (e.g., original 34th St. plan). Sun., November 27, 2011, 1:10 p.m.
. . . the comment of hers that you quote really strikes me as odd coming from Jacobs, now that I consider it again. First, she presents no evidence for why a city could not be built of nothing but Maiden Lanes –- she simply announces it. The second part of the comment is atypically aestheticist. “Insufferably quaint”? By whose standards? If it’s an impossible result, why belittle it? Although I haven't had a chance to reread the whole article, and although this article is earlier than "Death and Life . . . ", I suspect that in this article Jacobs was also interested in existing "great" (large) American cities -- not in the creation of brand new cities. So, the way I interpret it, Jacobs is saying here that great American cities have already been built up with mostly "wide" streets, so it's pretty much impossible to now remake them so that they have a bunch of Maiden Lanes, even if it was something you wanted to do. The way I interpret it, Jacobs comment about a downtown with a bunch of Maiden Lanes being "insufferably quaint" is only partially an aesthetic comment. It's really a comment about economic viability, as such a downtown would be all "show" and little "real" business. In such an environment, if such environments could even be created in the first place, it would be difficult for many necessary businesses to succeed (e.g., problems with truck deliveries, businesses being too "gritty" to fit in, a narrow base of businesses being too undiverse and also destroying secondary diversity, etc.). It seems to me that her criticism here about a bunch of Maiden Lanes being insufferably quaint is very similar to the criticisms that many people ERRONEOUSLY make about Jacobs herself -- that she was (so these critics say) interested only in "quaint" districts (e.g., supposedly Greenwich Village, which isn't as "quaint" as people make it out to be, especially when Jacobs was writing) for yuppies and whe was not (so these critics say) interested in real life districts that would work for everyone else. The way I see it, Jacobs is saying that even if it's virtually impossible to create a downtown with a bunch of Maiden Lanes, such a downtown is not even something that those who are interested in helping "great" American cities should even strive for, or work towards. In other words, people shouldn't think that Jane Jacobs is suggesting what many people today, in fact, do erroneously believe that she is suggesting! Sun., Nov. 27, 2011, 1:55 p.m.
"In other words, people shouldn't think that Jane Jacobs is suggesting what many people today, in fact, do erroneously believe that she is suggesting!" It doesn't directly address the narrow streets discussion, but she got to speak more informally and bluntly here than is typical in her writings or other interviews. I think it reflects several of her thoughts in their most "evolved" state in the final years of her life. The “functional” virtues of the narrow street I read as IMPLIED by the passage in "Death and Life," which suggests that in a pedestrian-focused area, wide streets provide few benefits, since . . . .
That's not my interpretation, but I haven't reread that part of the book yet. In general, though, I think it's important when teasing out implications to look at all the other things that Jacobs (or any other author) has written in a book -- how do these fit in with the supposed implication? With Jacobs' emphasis on the importance of business to a city's health, I find it hard to see such passages as an endorsement of "pedestrianism" (by which I mean pedestrian-only type streets). Plus, I believe there are spots in the book where she comes pretty close to specifically saying that "pedestrianism" is likely to hurt a city's health rather than help it, and where she suggests that just limiting, but not banning, vehicular traffic ("attrition") is, instead, a likely better way to aid a city's health. I agree that this doesn't mean that she's advocating only narrow streets -- far from it -- only that she understood their benefits in certain contexts. I would basically agree with this. I very strongly disagree with this. Again, it seems to me that Jacobs is interested in understanding how to help existing large American cities become strong and healthy again -- and this means economically strong and healthy -- and she doesn't see pedestrian-only streets as being helpful towards this end, but likely harmful instead. Jacobs has said elsewhere, and I think she also basically says it in "Death and Life . . . " that autos -- and, especially, trucks and buses -- are important for the health of modern "great" American cities. What she thinks works against the health of these cities, though, is an undue catering towards them -- especially with regard to private autos. Sun., November 27, 2011, 2:35 p.m.
P.S. -- May not have time to continue this discussion for a while. Have to get back to my reading of Jacobs! I think it's important to note the significant difference between pedestrianizing an already excessively wide street versus one that's very narrow and was probably pedestrian before the 20th century. Here in the US, the super wide building-to-building dimension doesn't lend itself well to pedestrian-only use because it's nigh impossible to attract enough pedestrians to fill up all that space. Thus it always seems empty and creepy. Even narrowing the roadbed doesn't always work if it's a struggling corridor, as was done with State Street in Chicago. In 1979 the roadbed was narrowed to only 2 or 3 lanes total, and only buses (and maybe taxis) were allowed. It didn't help bring back the street's vitality at all, and they put it back as a "normal" street in 1996, which actually helped quite a bit. Already narrow streets that are very mixed use, or at least that have a large retail/food component seem to be the best bet. Strøget, Copenhagen's main shopping street is quite narrow but had I think one-way traffic with parking and tiny little sidewalks in the mid 20th century. They pedestrianized it during the day, allowing delivery vehicles during off hours, and it's been a huge success, despite citizens originally saying things like "we're not Italians, this won't work here." So you definitely have to look at the specific circumstances. In the USA, a struggling street usually is not helped by pedestrianization, but an already successful shopping/mixed use street can, especially if there's transit service nearby. To pedestrianize an excessively wide "hypertrophic" street is likely to fail as well, and even narrowing the roadbed can be detrimental if there isn't the pedestrian traffic to keep it feeling busy. Benjamin: I owe you a response and will get around to writing one soon. Jeffrey: As for pedestrianization of wide streets, I agree. This is part of the issue Benjamin and I had been debating: since Jacobs notes that 1) people prefer to walk close to buildings even where the full roadway is available to them and 2) it takes vast crowds to congest a hypertrophic street, it would seem that you'd lose more activity than you'd gain by banning automobiles from center lanes in most cases. If you have it, in other words, you may as well use it. Still, if any place could get away with it, it would be New York, at least on certain streets. Something like a pedestrianized Lexington Ave., repaved in stone, embellished with fountains and lined with sidewalk cafes, would I think have foot traffic more than sufficient to make up for the loss in cars. @Benjamin: Yes, she does lay out a strategy of "attrition of automobiles by cities," which she describes, in part, as a process that will involve widespread diminishment of space given over the automobiles in the city through roadbed narrowing (i.e. sidewalk widening). She does not, so far as I remember, clearly spell out a likely end point for this approach. It was an outline for a strategy rather than the strategy itself. She seems to have envisioned it as a long-term, ongoing process intended to gradually increase the space given to the pedestrian and limit the space given to the car. In European cities, that process has ultimately resulted in the pedestrianization of certain districts, and greatly lessened traffic elsewhere. But Jacobs could not have been aware of that, because, in 1961, it had not happened yet. The car was very much in ascendance, so simply bringing about a change in emphasis probably seemed like enough of a task at the time. "The way I interpret it, Jacobs comment about a downtown with a bunch of Maiden Lanes being "insufferably quaint" is only partially an aesthetic comment. It's really a comment about economic viability, as such a downtown would be all "show" and little "real" business. In such an environment, if such environments could even be created in the first place, it would be difficult for many necessary businesses to succeed (e.g., problems with truck deliveries, businesses being too "gritty" to fit in, a narrow base of businesses being too undiverse and also destroying secondary diversity, etc.)." "The human scale of the whole thing and the density is far above what we are used to in North America, or anywhere. The high density and human scale are not incompatible at all." 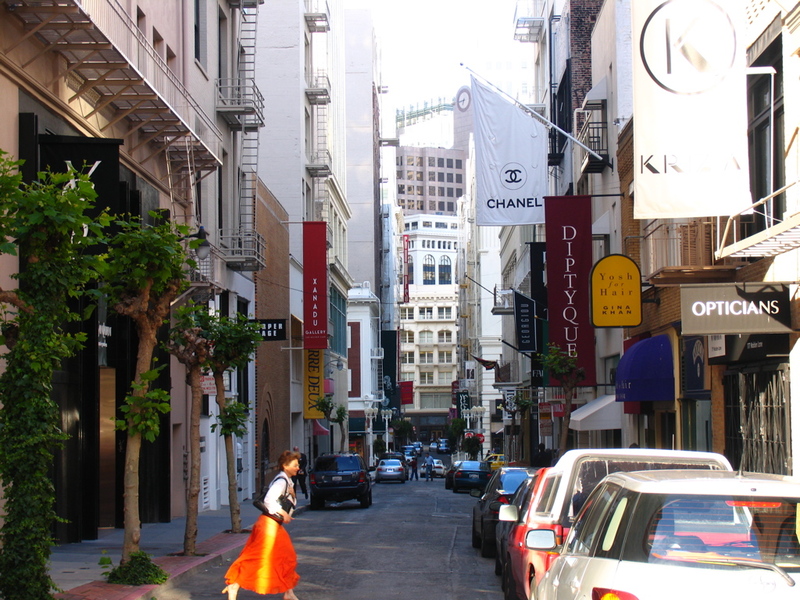 Two countries with prosperous cities abundant in Maiden Lane-like streets. So it's possible the Jacobs of 2000 might have amended her 1958 statement – we can't know for sure. I am watching a history of New York City and how the grid was imposed upon the northern part of the city in the early 19th century, mostly by the efforts of Dewitt Clinton. I wonder how people like Jane Jacobs and others who think of the city as an ever growing living organism think what NYC and other large cities like it would have been like without a grid?